I just finished dinner you guys and it was so amazing I had to sit down and post about it right away! The inspiration for this meal came from an incredible meal I had back in November. While visiting my parents in Nebraska my mom and had drove to Omaha and had one of the best meals of our life at Isa Moskowitz Vegan restaurant called Modern Love. 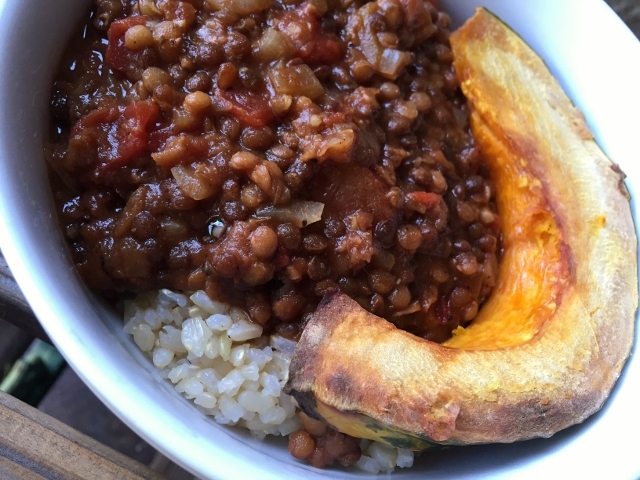 One of the scrumptious entrees we tried was a hearty lentil chili served in a bowl with big chunks of oven roasted squash served right in the bowl with the chili. It sounds really simple and it is but the flavor is anything other than simple. We have all most likely enjoyed some form of vegan chili that includes squash in the recipe – cooked right along with the other ingredients and it’s yummy. This method is even better. When you oven roast squash it becomes sweeter and gets a wee bit caramelized which adds even more depth of flavor. Now imagine the flavor of a spicy chili tempered by the sweetness of oven roasted squash. The hubby and I were all over this meal – oohing and aahing over the flavor for the entire meal! It was amazing! 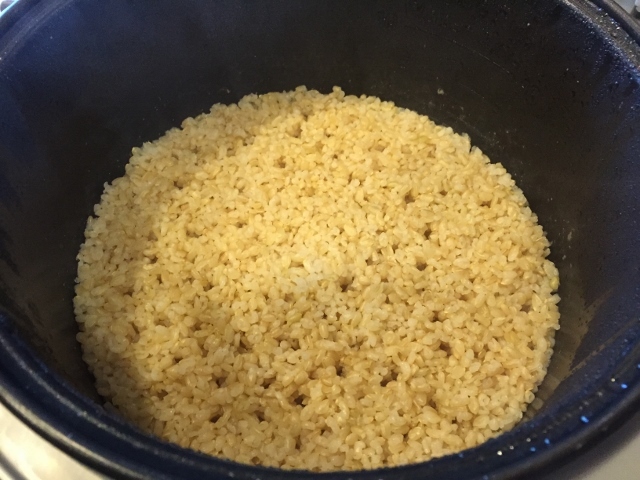 To get this meal together without much fuss I started off by getting some short grain brown rice cooking in the rice cooker which takes about an hour. While it was cooking away I began prepping the chili. I don’t know what recipe Isa uses at the Modern Love restaurant so I chose a tried and true recipe. This is one of my favorite chili recipes that cooks up quickly in the pressure cooker. If you don’t have a pressure cooker – no worries you can also make this on the stove top. 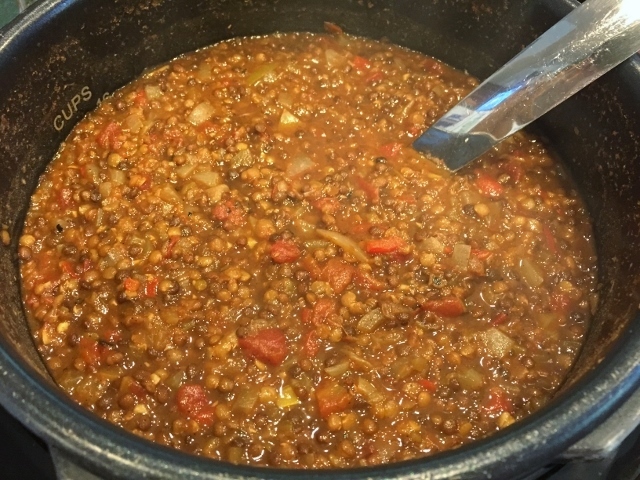 It’s Susan’s recipe from Fat Free Vegan Kitchen blog and its called Black & Red Lentil Chili. The only thing I do different is double the recipe – it still fits in the slow cooker and it cooks for the same amount of time. It also freezes really well so by doubling the recipe I have some extra for future meals. Tonight I used one green bell pepper and a red one. I like to toss them in the food processor so we don’t have big chunks of pepper. I think this method helps make the chili thicker too. Now that the rice and chili are cooking prep your squash. Tonight I used a Kabocha squash – I like that the skin gets tender while it cooks and you don’t have to peel it! Use whatever kind of sweet winter type squash you have. like a butternut or acorn squash. To make the squash easier to cut into use a sharp knife and cut a few slits in the whole squash – after you have washed it of course. Then place it in the microwave for 5-6 minutes on high. That is just long enough to soften the skin enough that it will cut much easier. Slice it open, clean out the seeds and cut it into half inch thick slices. I roast mine plain no seasoning required, in a preheated 400 degree oven on parchment paper for 30-40 minutes. Turning the pieces over after about 20 minutes. It gets all caramelized, sweet and scrumptious. 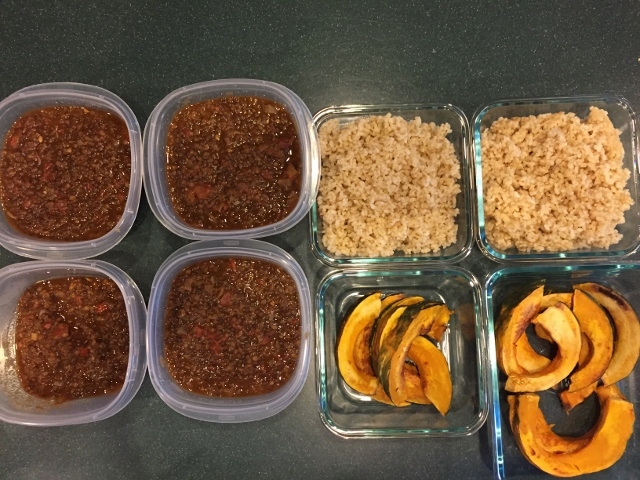 To assemble scoop some hot brown rice in the bottom of the bowl, top with a generous serving of the chili and place a big chunk of that oven roasted squash on top. When you eat it be sure to scoop up some squash with every bite. I am sure you will find yourself oohing and aahing over this meal much the same as we did tonight. Every bite was a burst of flavor! The best part is that you will have plenty of leftovers for future meals. We will be enjoying this meal again tomorrow. You can freeze some if you wish and enjoy it all over again in a few weeks on a night when you don’t have time to cook. The leftover rice can be used for lots of other meals later in the week. Oven roasted squash and brown rice are amazing cubed and tossed in a green salad with a balsamic vinegar dressing. 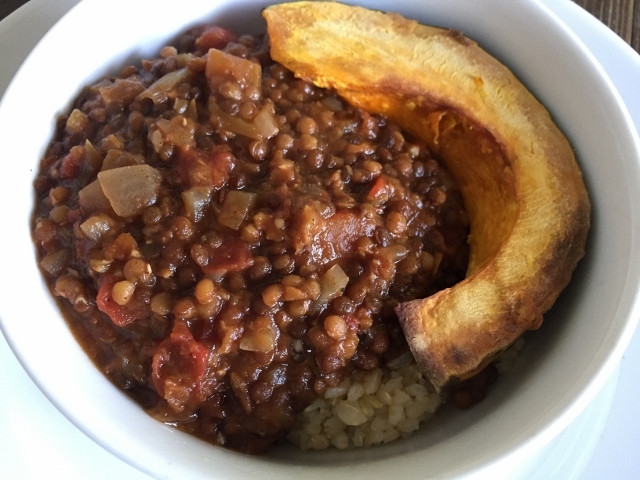 The Lentil Chili takes on a different taste when served over a baked potato or a sweet potato in stead of the rice, add some steamed greens and you have changed it up yet again. Tomorrow when the rice is cool I will freeze some of it in 2 cups portions then if I need some for a recipe or a quick meal its ready to go. Cooking for a whole food plant based diet doesn’t get any easier than this! If you try this (and why wouldn’t you?) please come back and let me know what you thought of it. I love getting your feedback. Please leave a comment and let me know you were here. Do you like short grain or long grain brown rice? I prefer the Lundberg Organic short grain – it has a nice chewy bite to it! I buy a huge bag of it at Costco and I store it in the freezer to keep it fresh. Jody I do too! Wouldn’t that just be the coolest thing! I hope we get to meet one day! This looks terrific! I have today off from work and will definitely make it. Btw, my son lives in Lincoln…are there any other vegan restaurants in Omaha that you can recommend? Thanks! Hi Cyd, My family live in Lincoln as well! In Omaha is Modern Love run by Isa Moskowitz the famous vegan cookbook author. There are more vegan restaurants in Omaha but I have not been to them – if you google it I am sure you will come up with more options. There are also a few vegan options in Lincoln – Pepes Vegan Bistro – its vegetarian but you can ask for things to be made vegan, Maggies Vegetarian Wraps – again ask for things to be made vegan, I don’t remember the names of the others right now but a friend took me to a couple of them. I was even able to get a vegetable plate at Cracker Barrel there – I had a plain baked sweet potato, green beans and corn – asked for no butter, oil or salt to be used. It was delicious! They have a Trader Joe’s and a Whole Foods so you can get plenty of good things to eat while in Lincoln. Oh and they have Chipotle too – so you can get a Chipotle salad – it will have sodium and a little oil but its not a terrible option. Hope that helps! This looks delicious! I can’t wait to try it. I’ve served some chilis in spaghetti squash ‘bowls’ and it’s such a nice touch! Great idea to serve chili in a spaghetti squash bowl! Who needs a bread bowl when you have a squash bowl? I love how we learn so much from each other. Having a community of healthy plant based eaters is the best classroom! Thank you so much for visiting my blog and taking the time to leave a comment. This looks so good! I love that black and red lentil chili recipe too. Great tip about microwaving the squash to make it easier to peel. I love butternut squash but I hate peeling it! I will try that tip out for sure. I’ll check back in after I try this out. Thanks! I also hate peeling butternut squash that’s why I love the ones that you don’t have to peel. I came up with the microwave solution one day when I had a very large squash that I didn’t think I would be able to cut all the way through and my hubby wasn’t home to help lend a hand. It worked like a charm and I have been doing it ever since! Do let me know what you think of the recipe. Thank you for taking the time to leave me a comment! I am so glad you are going to try it Colleen. A butternut squash, Acorn squash or Delica would all work! The chili is also good without the squash of course. Where in the Midwest are you located? I grew up in Nebraska and the first 10 years of our marriage we lived in Iowa. I grew up in northern IL, and live in Madison, WI now… in the Dairy State. Ironic, isn’t it? I went to my local co-op today, and found black lentils and Delica squash! I was pretty excited. I’m going to make it this weekend, and will double the recipe as you suggest. My husband likes my lentil soups and chilies, but he will eat it over chicken. It’s a start! I had to chuckle a little when you said your hubby eats your lentil soups and chilies but puts them over chicken! Like you said its a start. I hope you enjoy this recipe as much as we do. I am having the last of the leftovers tonight! Be sure to come back and let me know what you think of this meal. I feel so fortunate that I can just come here and get so many great recipes that I know will be winners. Thanks for all the experimentation and feeding our palates! It’s my pleasure! I love sharing about recipes, cooking techniques and healthy living. It’s my passion. I am going to make this this week. It looks awesome. Omaha is my home although living in Texas now. Still have my brother there. Most family on my mothers side are in and around Cherokee, Primghar areas. Spent wonderful summers there on the farm. I have heard wonderful things about Isa’s place. Love your blog Tami. Thanks so much for sharing yourself with all of us. You have enriched my life. Thank you for the sweet comments – you made me smile from ear to ear! It’s so nice to get some feedback and know that my time and efforts here are helping someone. How wonderful that we both have a connection to Nebraska. My parents and brothers all live in Lincoln. Isa’s Modern Love restaurant is nothing short of amazing. If you get back to Ne you really need to go there. Thanks so much for introducing yourself – I love getting to know like minded people. I got the ingredients for this….except the squash that I used tonight for another chili. 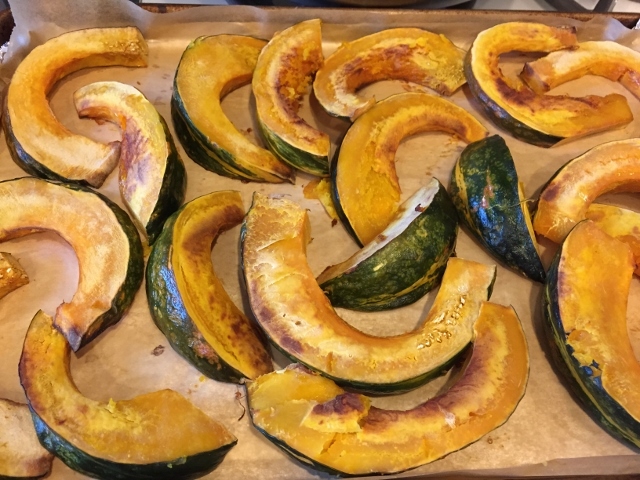 Curious about the Kabocha ….you can eat the peeling? and is the flavor like a butternut? The flavor of the Kabocha is very similar to butternut squash but I thinks it’s sweeter. You can eat the peel which I love – no peeling. It gets nice and soft and is easy to eat. If you can’t find one then feel free to use any other winter squash that is sweet. Its a favorite meal for me! I hope you enjoy it!